“Making History” will build upon GW’s “Vision 2021” strategic plan. The George Washington University publicly launched the largest fundraising campaign in the university’s 193-year history Friday, announcing a $1 billion philanthropic effort that builds upon “Vision 2021,” the strategic plan that will guide the university as it approaches its 200th anniversary. “Making History: The Campaign for GW” began with a quiet phase in July 2011. The university has raised more than $525 million to date. The university has grown its international research reputation in numerous disciplines in recent years and has created new cross-disciplinary institutes, building centers of learning and research such as the Global Women's Institute and Duquès Hall. 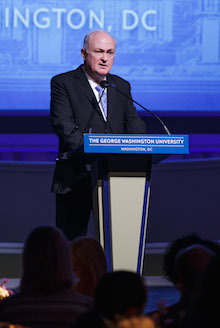 “Our ambitious goal—$1 billion to be raised by June of 2018—will enable us to implement the strategic plan that was unanimously adopted last year by the Board of Trustees and provides the blueprint for achieving the full greatness that was always in this university’s future,” said GW President Steven Knapp. The Science and Engineering Hall, the Milken Institute School of Public Health and GW’s new museum—which will serve as a modern learning laboratory for students, faculty and scholars—are examples of how GW is creating a leading research apparatus and building new state-of-the-art facilities. These projects complement an increased focus on undergraduates involved in research and joint research hires with government agencies and private entities. According to the campaign case statement, additional philanthropic resources will enable the university to hire and retain renowned faculty members who will educate and inspire students; create an undergraduate Science, Technology, Engineering and Mathematics (STEM) Academy; institute additional aid packages to recruit top graduate students; and develop joint B.A./M.A. programs that provide students with advanced skills in a shorter period of time. GW implemented fixed-rate tuition and has increased financial aid significantly in recent years. According to the campaign case statement, “Making History” will allow the university to meet a higher proportion of financial need and make a GW education accessible to a broader, more diverse group of students; establish diverse affinity-living residence groups to build stronger student communities; and renovate residence halls and athletics facilities to create additional, modernized space for student organizations, clubs and intramural sports. The university also plans to allocate significant funds to enhance student and career services. The university launched the campaign at an event on the grounds of the Mount Vernon Estate on Friday. Dr. Knapp, Mr. Carbonell and the Honorable B.J. Penn, M.S. ’80, former assistant secretary of the Navy for installations and environment and the inaugural chair of the campaign, participated in a “coining ceremony.” In honor of a longstanding military tradition and the university’s founder, the GW challenge coin symbolizes George Washington’s historic vision for a university in the nation’s capital that would serve as America’s intellectual hub and produce citizen leaders. The most ambitious campaign in the 193-year history of the George Washington University kicked off publicly Friday with a celebratory launch event at the university namesake’s Mount Vernon home.